House Number Signs: Modern House Numbers "3"
Made and imported from Germany. These attractive wall mounted modern house sign numbers are simply perfect! 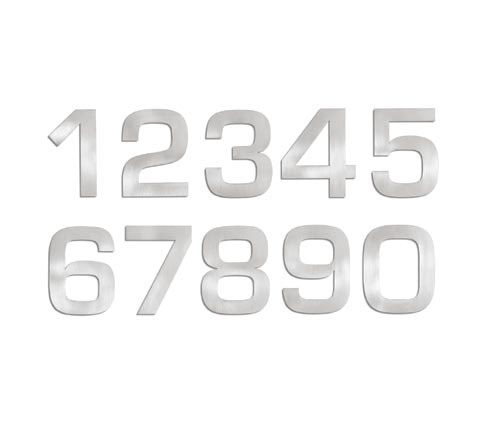 This sleek and stylish modern house number is made from durable stainless steel with a matte finish which makes them resistant to corrosion, tarnishing and discoloration. The house number's contemporary design is perfect for any home. These modern house number signs will add instant curb appeal to your place with minimum effort! This house number comes complete with a mounting kit and drilling template. Height of House Number: 5.6 inches. Width of House Number: 3.5 inches. Each House Number stands off from the wall by about 0.5 inches.